Nintendo has a stern policy not to change anything in Virtual Console games unless it is absolutely necessary. As such, only a very small number of Virtual Console titles have been different from the original releases - Notable examples have been the advertisements in Wave Race 64, trademarked words like yo-yo and Tetris in StarTropics and StarTropics II, potential seizure-inducing screen effects like some originally in Super Mario RPG and, of course, the configurable options in most arcade games. Now, however, Japan will be getting something very special for an upcoming game. For the franchise's 20th anniversary, Sega plans to release the original arcade version of Puyo-Puyo on the Virtual Console in Japan, complete with online multiplayer. We have no idea how Sega convinced Nintendo to allow this, but we're definitely not complaining - As long as we get the game as well, of course! No other online VC game plans have been announced, but it would be incredibly nice if other developers would be allowed to do the same for their classics. Perhaps they could even go back and add it to games already released? Just imagine being able to play games like Super Mario Kart and Fatal Fury online! We'll keep you informed about the game possibly heading to any other territories, as well as any online plans for other VC games, should they arise. Wow! Way to go Sega, Nintendo, and JP puzzle fans! I'm jealous. omg are you serious , i mean nintendo why would you set a policy like so not to change anything on a virtual console. this is amazing that a vc game is going to be online from nintendo , even if this isnt a game id probably get. if only they got rid of this policy and let the fans relive their glory vc days ONLINE. Leave it to Sega to try and spice up the stale Virtual Console. Y'know, I've realized something. Sega does a lot of firsts on VC. They had the first sale, and now first online. Do want, even if Wii Online is usually horrible. AWESOME! Let's hope that this becomes a huge success so that other VC games will be Wi-Fi enabled! Isn't that Dr. Robotnik’s Mean Bean Machine pictured above? Apparently, they're (including Kirby's avalanche) the same game! If this get's released in NA, I'll probably get it for friend (who played it more than everything else in Sonic Mega Collection). OMG!!! That's....that's....Dr. Robotnik's Mean Bean Machine!! If we got an online VC version of this, I would praise the freakin heavens. I am AMAZING at this game!!!! People would shutter in fear of me online! Oh please please please please PLEASE let this come to the US!!!!!! @shinesprite Yes and no. They changed the name outside of Japan to Dr Robotnik’s Mean Bean Machine since Sonic was the hottest thing at the time. Japan never got the Dr Robotnik version till Sonic Mega Collection. Awesome! The one flaw I could think of is desync, a problem with bringing most non-online games online. (Anybody remember Kaillera?) But I think Sega has this in good hands! Maybe this change of heart comes after seeing the results of the suped up old games planned to come out on the 3DS. 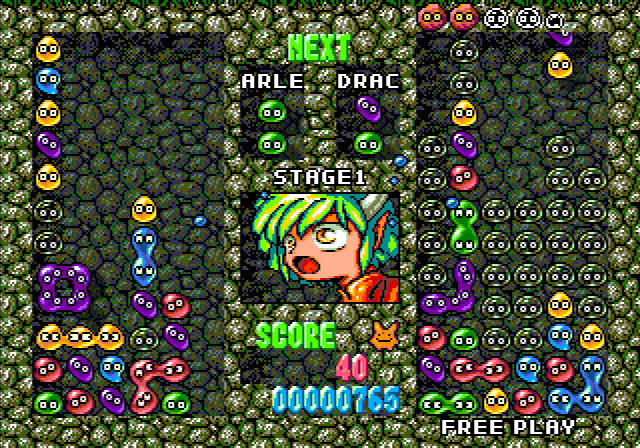 I almost yelled Mean Bean Machine until I realized that MBM was just a Eggmanified version of Puyo Pop. @Dragoon Trainer: You're speaking my language there! I do not really believe about the "absolutely necessary" condition; F-Zero's car flashes differently when crashing against an edge. As such, this is only slightly less surprising to me. Let's hope this makes it to the rest of us! Mario kart arcade GP 2 on vca with online, please nintendo. Now perhaps Sega will 'bravely' argue for its games to be PAL optimised. Honestly, this is typical Nintendo: "test the waters" with something every other online provider has been doing for years by laboriously seeing how it works out with a solitary title. Maybe by 2016 this might be a regular feature. Don't forget that Pokémon Snap got that update where photos can be saved to SD cards. Draco can't believe it herself, from the look she is giving in the picture! It will be nice to play the orginal online. I know you can play online in Puyo Puyo 7 (Wii and DS), but the orginal rules could not be used, where you can't counterattack the unwanted puyos. We better get this game. The fact we have got Puyo Puyo Tsu does mean there is a chance. Awesome, if this comes to NA, I will instantly buy it. I could request TONS of VC titles that NEED online multiplayer, but I highly doubt it will ever happen. I can see this spicing up the Virtual Console for awhile. If this games comes to North America/Europe/Australia with online, people should buy this immediately. I know I will. Awesome. I would buy this if it came to America just to support the idea in hopes they will do it with more games! And I like puzzle games, so I'm sure I'd enjoy it anyway! Wow. That's a definitely a good way boost VC sales. I have no interest in puzzle games though, so hopefully some other titles will see it. Give me some online co-op play with Streets of Rage and Donkey Kong Country. That would be awesome! 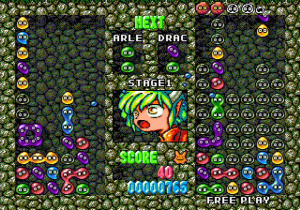 I'd play Puyo Puyo online. Ah, I was looking forward to how you would put a negative spin on this announcement, Hardy. SEGA please publish this in England and Europe, With worldwide play online. Please! Damn I want Animal Crossing 64 for the vc now! If this came to the USA I'd never stop playing it. Pokemon Snap had added feature to send pictures, that wasn't absolutely necessary. People don't realize but this is one of the best falling-block puzzlers there is. I remember them having an update for Kirby 64 (I don't know what the update was for exactly). They should go back and update some games for online play. Mario Party 2 would be sweet to play online.. Even Super Smash Bros.
Nintendo to add online functionality? Blasphemy! I second that plea from Sonic1994CD! I would die if they released N64 Animal Crossing on the VC all translated and everything. It would probably run 1500 points since that would be A LOT of translation but I would definitely buy it. C'mon Nintendo! Let's go!! That's because Sega does what NintenDON'T. Even on Nintendo consoles. ...Er, I don't see why people would go back to Puyo Puyo for online because the online capabilities were already covered in Puyo 7 & 15th. I guess it's for the super die-hard fans who don't want offsetting (which I don't understand kinda.). Well, it's a step at least. Here's hoping to more in the future. I don't care. It's not like this will light the VC on fire, or cause some rush of content for the unfortunately mostly-dead service. I just want some more quality games. C'mon Lucasarts - JUST ONE MORE! RERELEASE METAL WARRIORS DAMMIT! PLEASE!!!! @Token Girl: Hahah - you're totally right. Sega clearly does what Nintendon't. They should bring that back if they're going to keep this kinda stuff up! If more games could have this feature the VC sales will go up because a lot of this games are easily available by ROM´s or a lot of people have the cartridges and this option will make them to buy it again. I don't want this game to come to our VC but I do want the online play feature to be used for either Kirby's Avalanche or Dr. Robotnik's Mean Bean Machine. If they can expand it to any other game like the many Super NES & Neo Geo games then that would be very awesome. I have a good feeling N allowed this "test", in light of the 3DS d/l service. They know they have thus far flubbed the screen res on the GB/(GB)C titles. They also know that the virtual handheld concept is one of the drawing points of owning a 3DS. Also, Nintendo wouldn't do this for a lot of titles. Why make SMK, for $8, online enabled, when they can sell MKWii for $50? It's the same logic as to how their next system more than likely, won't support the Wii's online gameplay, much like the Wii can't do MKDD online. Still, as the person in my household who used to be the other human player I'd play games w/, &/or against does mostly pc games anymore, I'd gladly take an online SMB3. It's about time Nintendo allowed companies to adjust their games for VC. Is it really necessary to play 16 bit games on the Wii with their original slowdown. I appreciate authenticity based nostalgia, but how many games such as Metal Slug 2 would become suddenly that much more playable if they didn't try to emulate their paltry original hardware...or how difficult would it be to add leaderboards to all those shooters released on VC...puzzle games like Magic drop would definitely pick up sales...the articles suggestion of fighting games or Mario Kart being given online multiplayer would be awesome but I think that's wishful dreaming...I only hope to be wrong (I would gladly shell out ten or twelve bucks for that Mario Kart purchase). Hopefully SEGA's move will nudge the big N in the right direction. I already bought Super Mario Kart, but I would buy it again if it had online play. I'll believe it when I see it though.